Last year was my “Year of Stupid Races“. I ran several multi-race events including the Dopey Challenge, the Nut Job, the Heartbreak Hill Hat Trick, and the Dumbo Double Dare. I decided that I had to be stupid to run all those back-to-back races. It looks like I am setting a different trend this year. I think this year will be called the “Year of the Climb”. It started back in March when I ran the Caesar Rodney Half in Wilmington, Delaware. The course started at an elevation of about 92 feet above sea level and climbed to over 247 feet before descending back for a finish at 104 feet. We ran steadily uphill for over 4 miles. I thought that was bad and could not understand why people run this race every year. Then in May I ran the Flying Pig Half in Cincinnati, Ohio. The course started at an elevation of approximately 466 feet above sea level and climbed to about 840 feet. I remember running continuously uphill from about Mile 5 to Mile 9.5. It seemed like we would never stop climbing. Every time we turned a corner, I expected the course to flatten out but it didn’t. The run back to the finish line was all downhill but very hard on my knees. We finished back around 500 feet. I swore I would never run that one again. 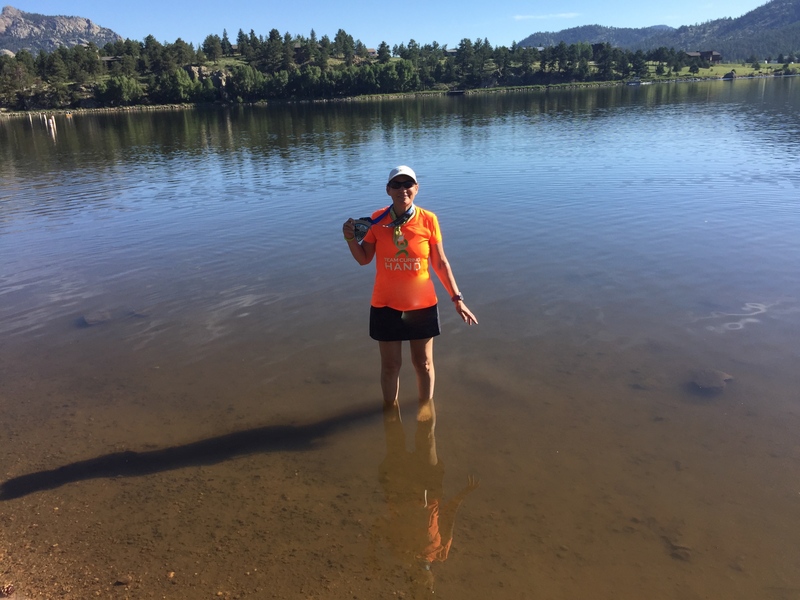 This weekend I ran the Rocky Mountain Half Marathon in Estes Park, Colorado. That race took climbing to a whole new level. 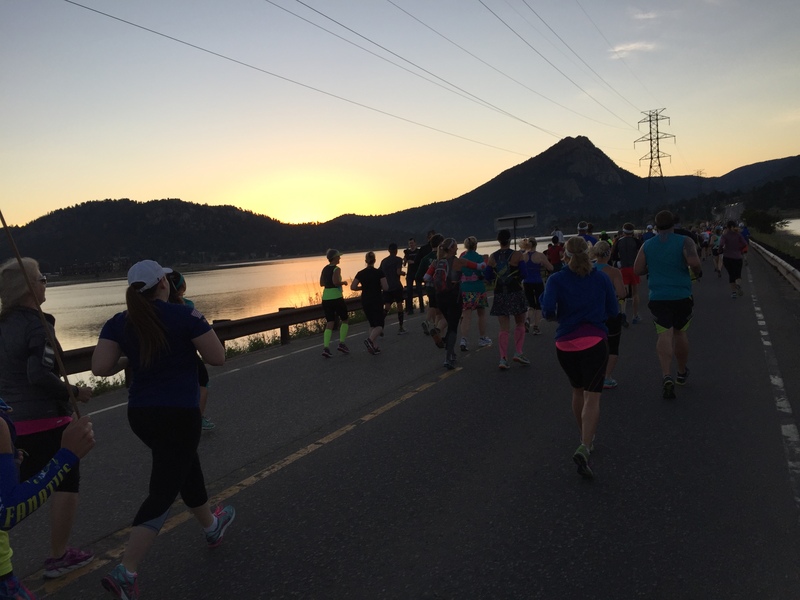 The race was organized by Vacation Races, a small company that puts on races at elevations of 1,200 feet and up. The races are held near some of the most beautiful national parks in the United States – Zion, Grand Canyon, Grand Teton, Yellowstone, and Yosemite to name a few. 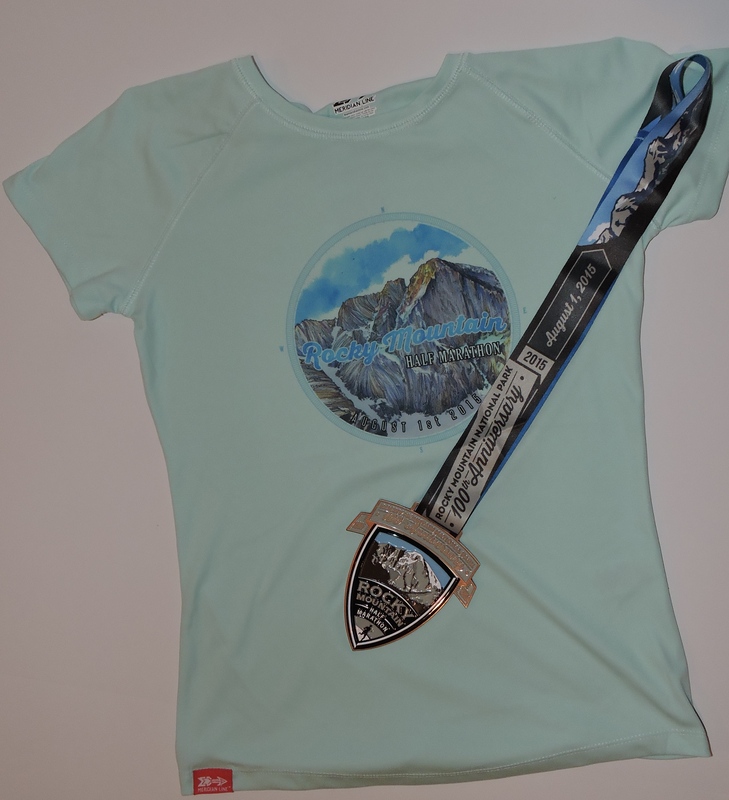 The Rocky Mountain Half was held outside Rocky Mountain National Park and celebrated the park’s 100th anniversary. With this race I would be checking off Colorado on my 50-state endurance challenge. Estes Park is located at 7,522 feet above sea level but I live around 400 feet above sea level. Altitude sickness was a risk. Altitude sickness can cause headaches, breathing problems, dizziness, fatigue and a bunch of other unpleasant things like brain swelling. All the literature I read on altitude sickness said to allow time to adjust to the higher altitude and drink lots of water. With that in mind, I arrived in Estes Park two days before the race. 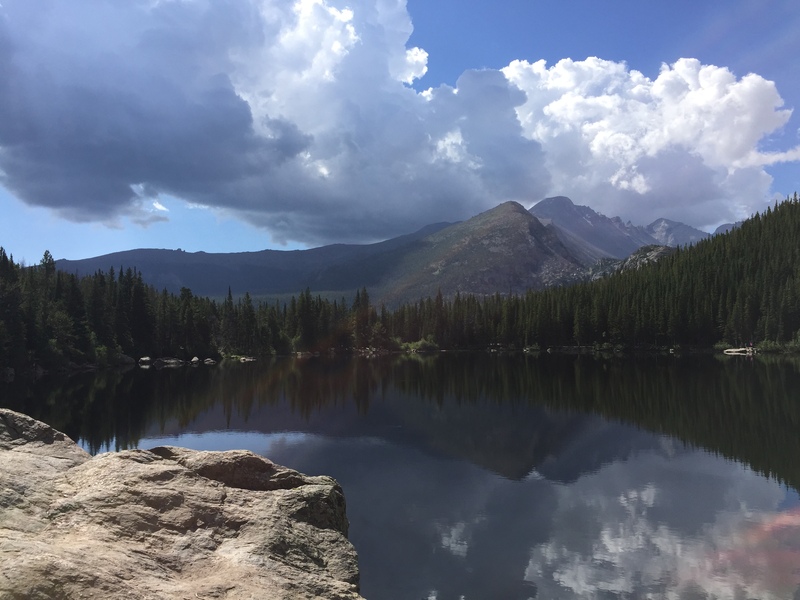 My husband accompanied me on the trip so we spent a day driving up into Rocky Mountain National Park, reaching over 12,000 feet above sea level before returning to Estes Park. Ascending and descending is one strategy for acclimatizing. I also drank nearly a gallon of water a day while I was there. Interestingly, I noticed if my head started to hurt, I felt better almost immediately after I drank water. Packet pickup for the race was held at the Stanley Hotel, known for being the inspiration for Stephen King’s book “The Shining”. It is a beautiful old building. The hotel capitalizes on the book with a night ghost tour and “Redrum” glasses in the gift shop. The race started at 6AM on Saturday morning. The temperatures were in the 50s with virtually no humidity. Normally I would be wearing gloves and earmuffs at those temperatures but I found it was very comfortable – certainly better than the 90+ temperatures I had been running in at home. There were less than 1500 runners entered, which I find is my favorite race size. The start was one of the most beautiful race starts I have ever experienced. The sun was just coming over the mountains as we headed out. Normally I go out too fast at the start of a race but there was no worry about that. The air is much thinner in Estes Park so I found breathing more difficult. That slowed me down. One of the pace setters had told me to add about 30 minutes to my normal half marathon time due to the altitude. She was absolutely correct about that. The first 3 miles were relatively easy, aside from the breathing problems. After that, it was all up hill, or more correctly, up a mountain. I normally don’t have much of a race strategy, though I probably should. I just lace up my shoes, put on my bib and timing chip, and run. Well, this was a race that required some strategy. The course started at 7,578 feet above sea level then climbed to 7,929 feet. We would finish back down at 7,578 feet. By Mile 4 the course was beating me; I could not maintain my normal pace. Then I decided to change how I was running the race. I remembered that Jenny Hadfield coaches people to run based on effort, not pace. As Jenny explains it, the body doesn’t know pace. The body knows effort. Jenny has a three color system to help runners determine where they are in terms of effort. Yellow is the easy zone where you can talk without pausing to get your breath. Orange is a more challenging; when you talk, you have to pause to get air every few words. Red is the most challenging; you can’t talk. If there was a color to describe what is more challenging than Jenny’s Red level, that is where I was on Saturday. It was tough. I follow Jeff Galloway’s run/walk method. By Mile 4 I knew I could not maintain my normal 2 minutes running/1 minute walking routine. Recently Jeff has been encouraging runners to try a new run/walk strategy with a shorter walk break such as a 30 second run/30 second walk. I had tried that ratio in the past and found it difficult to follow. But today I knew that was the only way to make it to the finish line. By focusing on my effort, not my pace, and changing to a 30 second run/30 second walk, I was able to relax and start to enjoy the race. 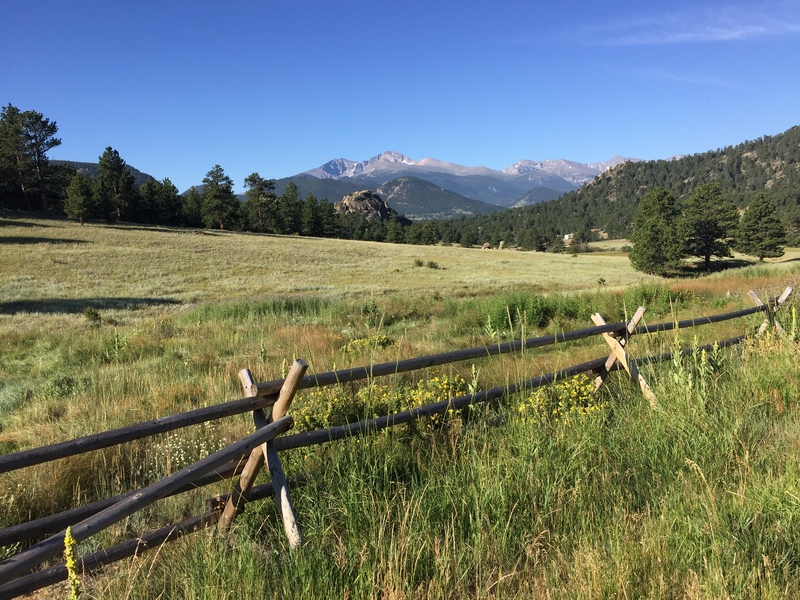 I was able to look at the surrounding mountains in Rocky Mountain National Park as I ran. The race organizers had said that the views when we reached the top of the mountain would be worth the hard climb. They were right. The finish line was in a park by Lake Estes. Many of the runners took off their shoes and waded into the cool water. It felt incredibly refreshing. My biggest fear when I ran this race was that the blood vessels in my eyes would explode from over exertion. After I crossed the finish line and found my husband, I asked him to look at my eyes to make sure they were ok (they were). Later I joined several other 50-State Half Marathon Club members at a local restaurant for brunch. I decided that I had earned a beer. Beer with an egg and cheese croissant never tasted so good.